The use of SSL encryption for all enterprise Internet traffic is growing steadily. Applications that make use of SSL – such as SharePoint, Exchange, WebEx, Salesforce.com and Google Apps – are commonplace. Even email applications like Gmail, Yahoo, and Zimbra are being used in workplace environments as hosted email or BYOD apps. It’s clear that organizations now need complete visibility into the SSL traffic coming across the WAN. They need the ability to preserve complete network and web histories from encrypted network and web traffic for compliance, regulatory and logging requirements. 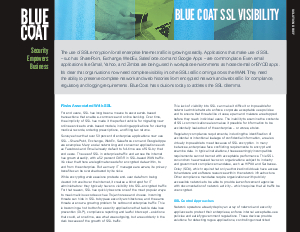 Blue Coat has solutions today to address the SSL dilemma.